A navigable canal along the Bug river? New research shows it would rob the region of water. Operating a navigable canal requires large amounts of water because its locks need to be filled each time a barge passes through them. In the case of the projected canal alongside the Bug river in Poland, the water is supposed to come from the smaller rivers in the region, from the Bug river itself or from the Vistula. However, new research demonstrates that the rivers Wieprz, Tyśmienica, Bystrzyca and Wilga do not carry enough water, pumping water from the Vistula would be too expensive and might not be technically feasible at all, while using water from the Bug would greatly increase the frequency of severe droughts in the region, harming local inhabitants, farmers and the unique natural environment of the Bug river valley. The Bug is one of Europe’s last unregulated large rivers with a unique natural value. Its valley boasts an abundance of diverse habitats, including wet meadows, riparian forests and wetlands. Those habitat types are increasingly rare in Europe but in the Bug river valley they host more than 100 butterfly species and 158 breeding bird species, including many rare, protected species and species threatened with extinction, while the river itself is home to 44 fish species. The Bug river valley is also an important wildlife corridor and the backbone of the region’s unique cultural landscape. For those reasons regulating the Bug for the purposes of navigation is out of the question, and the plans concerning the development of the E40 inland waterway connecting the Baltic Sea and the Black Sea now envisage building an artificial canal along the river. In theory, artificial canals are less environmentally destructive than channelizing and dredging of natural rivers. However, the projected canal along the Bug would have an extremely negative impact on the hydrological situation in the region, considerably increasing the frequency of droughts and lowering groundwater levels in adjacent areas. New research shows that operating the canal, and especially filling up its locks to make the movement of barges possible, would require pumping water from the nearby rivers at the rate of 10,96 to 13,69 cubic metres per second, depending on the variant. According to the research authors, only the Vistula and the Bug carry enough water to make that possible. The smaller rivers in the region, i.e. Wieprz, Tyśmienica, Bystrzyca and Wilga, do not have enough water, even if it were to be sourced from multiple rivers simultaneously. Sourcing water from the Vistula would be problematic for economic and technical reasons: pumping such large volumes of water uphill for each sluicing operation would be too costly and might not be feasible at the required rate. The worst consequences, however, would ensue if the water were to be sourced from the Bug. In this case, too, costly pumping of large volumes of water would be necessary. For the Bug river, it would mean a drastic decrease in its water resources and a change in its flow regime, especially in the periods of drought. Withdrawal of water from the Bug in any of variants would result in a 17.5% reduction of the frequency of days with overbank flow on average and a 172% increase in frequency of severe droughts! - indicates dr Mateusz Grygoruk, Warsaw University of Life Sciences WULS – SGGW, Save The Rivers Coalition/KRR. The authors of the report also call into question the assumption made in the Feasibility Study for the E40 waterway that in each variant, the canal would supply aquifers in the adjacent areas with water. According to their calculations, in some sections water from the canal would indeed exfiltrate into groundwater, which could potentially cause inundations. In other sections, water would be moving in the opposite direction, draining aquifers along the canal and lowering groundwater levels, with all the negative consequences for farming, households and ecosystems. The red sections of the proposed canal variants would drain groundwater in the adjacent areas, while the blue sections would exfiltrate water into adjacent aquifers. In each of the variants, the construction of the canal would severely disrupt the region’s hydrological situation, with catastrophic consequences for its natural environment: the peatlands, wet meadows, wetlands and riparian forests. The disturbance of water relations in the region connected with the functioning of the canal, ie lowering the groundwater level and reducing the frequency of Bug floodings in the vast floodplains, would have a negative impact on the nature of the region, where peatlands and wet meadows are the hallmark - says dr Ewa Jabłońska, Warsaw University. 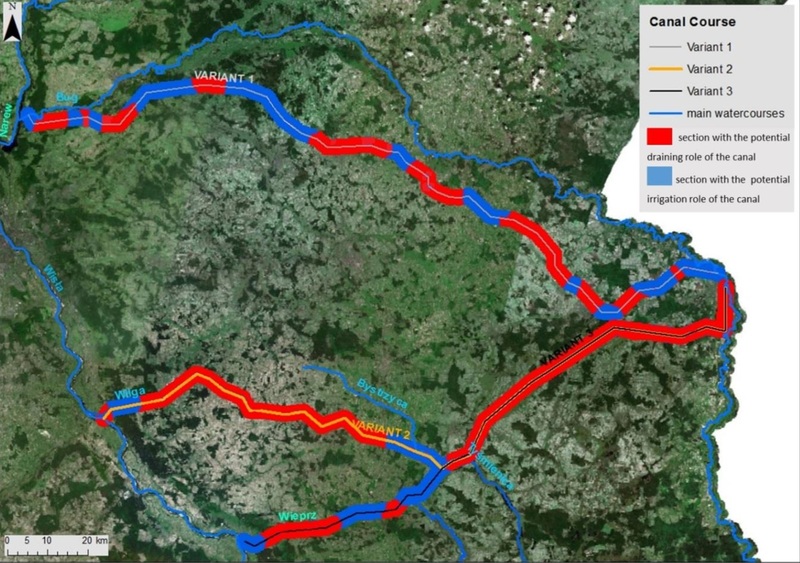 In variant 3, the canal would be built in the Wieprz river valley, which would destroy it completely along with the Dolny Wieprz Special Area of Conservation. Even though none of the variants of the projected waterway run in the Bug riverbed, all of them may lead to significant negative impact on the Bug river and its valley, resulting from the possible water deficits in the Bug, the reduction of river water flooding on its vast floodplains and the lowering of groundwater levels. Those disruptions would be particularly harmful for the birds present in those habitats, including the white stork, black stork, western marsh harrier, corn crake, common snipe, black-tailed godwit, Eurasian curlew, ruff and common redshank, and the numerous protected butterfly species inhabiting the wet meadows. The lowering of groundwater levels would also lead to a degradation of peatlands, with a negative impact on the climate (CO2 emissions from drained peatland represent almost 5% of the total global anthropogenic greenhouse gasses emissions) and the regional environment where it would disrupt water cycles, cause nutrient loss to ground- and surface water, affect biodiversity and increase the risk of peat fires. The lowered groundwater levels would also negatively affect several Natura 2000 sites. Lower availability of water would also inevitably create new problems for agriculture in the region. The creation of E40 IWW in any variant may be in violation of the Water Framework Directive, which does not permit the implementation of projects that adversely affect the status of water bodies if the objectives of such projects (in this case, the transportation of goods) can be achieved with less environmentally harmful means (in this case, the development of railways) - dr Jarek Krogulec from OTOP, Save The Rivers Coalition/KRR comments. The research was commissioned by the Frankfurt Zoological Society and conducted by dr Ewa Jabłońska of the University of Warsaw and dr Mateusz Grygoruk, Paweł Osuch and Paweł Trandziuk of the Warsaw University of Life Sciences. In 2015 the Polish government adopted a document titled Objectives of the inland navigation development plans in the years 2016-2020 with an outlook to 2030 (Założenia do planów rozwoju śródlądowych dróg wodnych w Polsce na lata 2016–2020 z perspektywą do roku 2030). It envisages ‘improving the conditions for navigation’ on the river Vistula (as part of the E40 inland waterway connecting the Baltic Sea with the Black Sea) by building the Lower Vistula cascade and a new dam on the Upper Vistula in Niepołomice, and by preparing the construction of an inland connection between Warsaw and Brest (originally, via the river Bug which would be regulated for this purpose; the current plan is to build a navigable canal along the Bug in one of the three proposed variants). The document also plans for upgrading the Oder Inland Waterway (E30) to international standards and integrating it into the network of international inland waterways. Environmental organisations are objecting against the governmental plans because their implementation would involve destruction of protected areas and habitats on an unimaginable scale. The construction of just the first element of the Vistula cascade, i.e. the new dam in Siarzewo on the Lower Vistula, would entirely destroy (permanently inundate) the Włocławek Vistula Valley Natura 2000 site and partly destroy two other Natura2000 sites: the Nieszawa Vistula Valley and the Lower Vistula Valley. Full implementation of the plans laid down in the Objectives document would lead to the loss or degradation of more than twenty Natura 2000 sites. Interestingly, Poland’s national development strategy (Strategia Odpowiedzialnego Rozwoju, SOR) adopted in February 2016 is rather sceptical about the benefits of inland navigation, and its strategic environmental assessment states directly that “the project raises serious doubts with regard to its potential negative impacts on water resources and the environment, including water-dependent ecosystems (Chapter 4.3.3). It also raises questions of economic nature (the economic viability of this mode of transport) and technical questions, as it is still unclear if sufficient quantities of water needed to make river transport possible would be available.” The SOR strategic environmental assessment also clearly states that the inland navigation plans should be laid down in a proper strategic document (the Objectives document is a fifteen-page brochure containing a very general sketch of the plans) and undergo their own strategic environmental impact assessment as required under Polish and European environmental laws. Three years on, however, no such strategy has been drafted, and no strategic environmental impact assessment has been made for the inland navigation plans. The Objectives document states that in the long term, the Oder Inland Waterway (E30) would carry 25 million tonnes of cargo, while the demand for cargo transports on the Vistula has been estimated at 12 million tonnes. According to Statistics Poland, the total volume of cargo transports in Poland in all transport modes was 2053.3 million tonnes in 2017.